Continuing our Friday series of welcoming Shabbat around the world with a different version of Adon Olam each week, we present Yehuda Glantz playing it on the charango with the Israel Philharmonic Orchestra and adding a Spanish twist to the familiar song. The charango is an ethnic South American instrument similar to the ukulele. Born in Buenos Aires, Argentina, Glantz is a unique and original artist in the Israeli and universal Jewish world art scene. 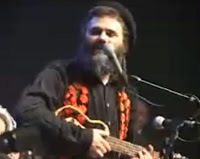 He has created his own musical style, a fusion of hot Latin rhythms, energetic Chassidic rock beats, and Jewish soul music. He plays 14 different traditional and ethnic South American instruments. He also writes, composes, and produces all his music in his studio in Jerusalem, where he has been living with his family since 1979.